Our Expansion Joint Covers are factory-manufactured flexible, weather proof, exterior covers for structural expansion joint openings, and are effective closures for a wide variety of special applications. These covers are for sealing and waterproofing of high-expansion interfaces common in roofing, parking garages, large concrete decks. We have Expansion Joint Seals & Covers in a variety of materials, widths and shapes to fit all types of construction. See below. We also have related items under Flashings and in the categories of Backer Rod, Expansion Joint Sealants, Metal Goods and Pipe Seals. Concrete expansion joints up to 2 inches wide can be sealed with a self leveling expansion joint sealant. Sonneborn SL1 / SL2 and Novalink SL are most popular. 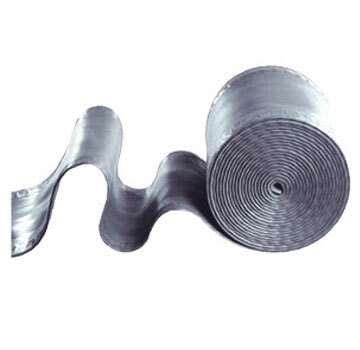 Soft celled Backer Rod is used together with self leveling expansion joint sealants. It is used for expansion joints around pools, driveways, etc. See Backer rod sizing and installation information. Roofing Expansion Joint COVERS: For larger or higher movement expansion joints we have pre-fabricated joint covers. These are available in galvanized steel, stainless steel, aluminum and copper. Various shapes accommodate all constructions configurations. Splicing kits are available for each type. Please email sales@bestmaterials.com for current pricing if there is no link below. BELLOWS SELECTION CHART The Named Width is the FLATTENED OUT dimension of the rubber section (ie, when pressed flat). For example, for a 6-inch gap, you need to order a 10" size. SEE THE BELLOWS SELECTION CHART BELOW. Expansion Joint Systems, Seals & Covers are flexible weatherproof, exterior covers for structural expansion joint openings, and are effective, closures for a wide variety of special applications. Widths are designed in various sizes to cover 4 to 12" wide expansion joint openings. Products feature a unique 3-ply flexible reinforced Hypalon bellow supported by a durable closed cell foam, which allows for anticipated movement in the structure, and metal mounting flanges factory locked to each edge of the bellow. Expansion Joint Covers with reinforced Hypalon bellow withstand the most extreme chemical and weather conditions without leakage. Accessories (corners, tees, end terminations, and crossover intersections) are designed for maximum flexibility and are produced using special techniques to ensure clean seam lines and watertight applications. Field seams are easily accomplished with standard splice kits. Roof Expansion Joints are recommended to be provided for any one or more of the following minimum conditions. Roof Expansion Joints are recommended to be constructed with raised curb assemblies which can allow adequate base flashing details for the roof system. Raised curb assemblies should be factory fabricated of galvanized steel to suit all project conditions which expedites and unifies project design and installation as opposed to traditional wood curbs which require extensive field installation time and thorough inspection of construction and attachment. Over the raised curb assemblies, or at low profile expansion assemblies, the Portals Plus Expansion Joint Covers provide superior watertight integrity. Along with the standard cover profiles of Curb Flange, Combination Curb & Straight Flange, and Straight Flange, Portals Plus offers factory manufactured accessories available to suit virtually any project condition. The most common accessories are Corners, Intersections, and Ends. All factory manufactured accessories are custom made to suit each individual project's conditions, thereby assuring clean seam lines, continuity of joint material, and watertight integrity when properly spliced with Portals Plus standard splice kits. Contact Portals Plus for questions regarding any special details or applications. Expansion Joint Products includes special products for sealing and waterproofing of high-expansion interfaces common in roofing, parking garages, large concrete decks and related waterproofing applications. Expansion Joint Seals & Covers are flexible weatherproof, exterior covers for structural expansion joint openings, and are effective, closures for a wide variety of special applications. We have related items under Flashings and in the categories of Backer Rod, Expansion Joint Sealants, Metal Goods and Pipe Seals. Concrete expansion joints up to 2 inches wide can be sealed with a self leveling expansion joint sealant. Sonneborn SL1 / SL2 and Novalink SL are most popular. Soft celled Backer Rod is used together with self leveling expansion joint sealants. It is used for expansion joints around pools, driveways, etc. See Backer rod sizing and installation information.